So today we took the delightful (caution, Irony alert) 24 Bus down to look at bicycles and wound up riding two of em the 5 miles back to the Marina. 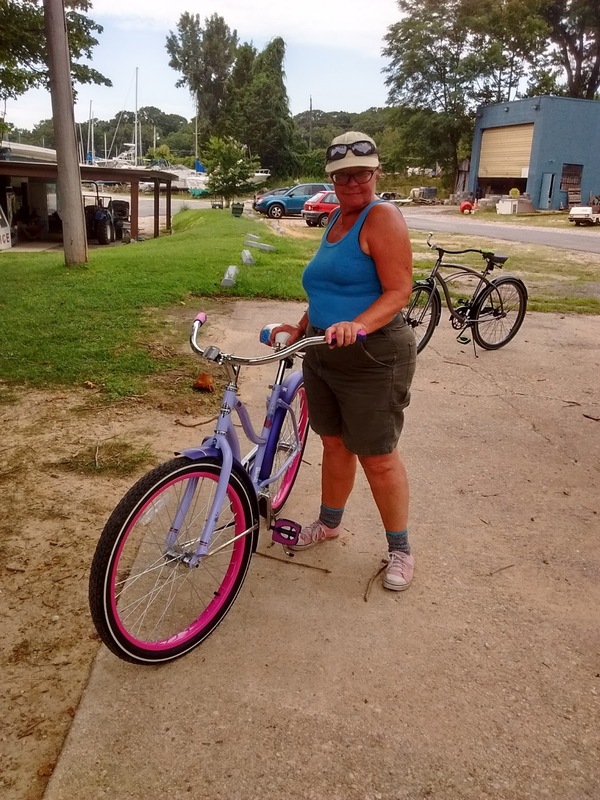 So we are now the proud owners of two new beach cruisers, with no gears (it's flat here) and fat tires (because the roads here sucketh), which puts pretty much anywhere we need to go (closer than train transit) within range. Now we just have to clean out our poor deceased car and get it hauled away. And then, back to boat stuff, we promise, but it's all part of living aboard. Lots of new stuff over at Life, Art, Water. Check it out. I'm curious as to how you feel about the bikes this winter. Back to the busses to get your groceries? In our case, the primary grocery stores are in easy walking distance. We get pretty mild winters here, with very little snow (though it doesn't feel like that when it hits). The bikes will be able to be used for probably 90% of the year. We'll see.